Only three of the thirteen native maple trees in Canada are important in syrup production. Acer Saccharum, better known as sugar maple or hard maple, produces most of the sap used for syrup. Other maples, Acer Nigrum (black maple,) and Acer Rubrum (red maple,) are also tapped. Trees should be 25 cm or 10 inches in diameter before they are tapped so that the tree can recover from the tap wound. A tree this size is from 30 to 60 years old. Maple trees may live to be 300 years old and will have been tapped for 250 years. 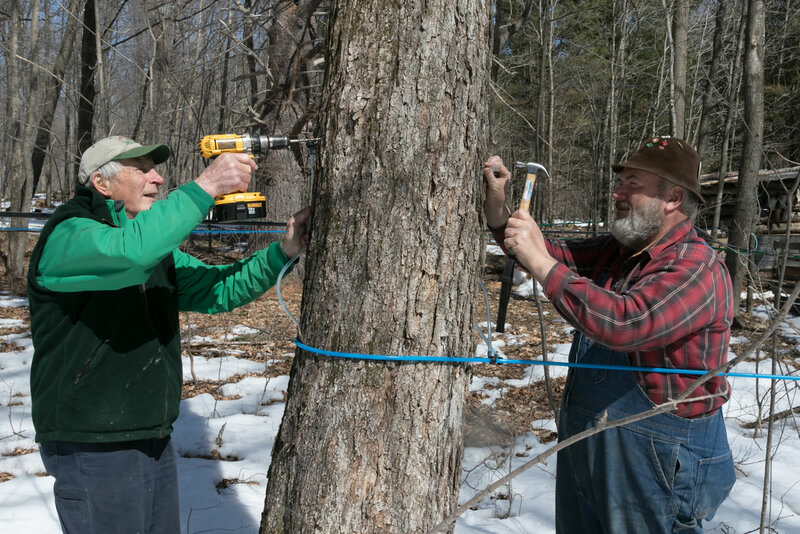 Each tap produces enough sap over the season of four weeks to produce one litre of syrup. The amount of sugar in the sap varies from tree to tree and from day to day. The sap in the Fortune’s sugar bush averages about 2.5% sugar. The maple tree contains carbon dioxide gas as well as sap. When the temperature drops below freezing at night in the spring the gas contracts creating a negative pressure or vacuum inside the tree which pulls the sap up from the roots. In the daytime the tree warms the gas. 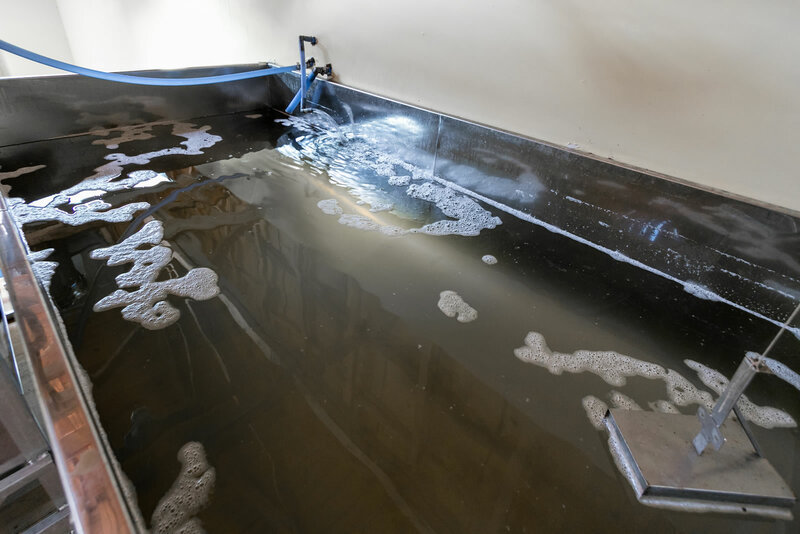 This causes the gas to expand, putting the sap under pressure and forcing it to run out the tap hole or any other break in the tree’s bark, and back to the roots. The sap runs until the pressure inside the tree is equal to the atmospheric pressure. Cold nights and warm days create ideal sap weather. Even after the boiling, concentrating and filtering process, some of the nutrients remain in the syrup for you. Sap becomes sweet during the cold weather when the starch which is in the root system is converted to sugar. Trees manufacture starch in the summer through photosynthesis. The larger the crown of leaves on the tree the sweeter the sap. Trees can provide us with some of their sap and sugar without ill effect. 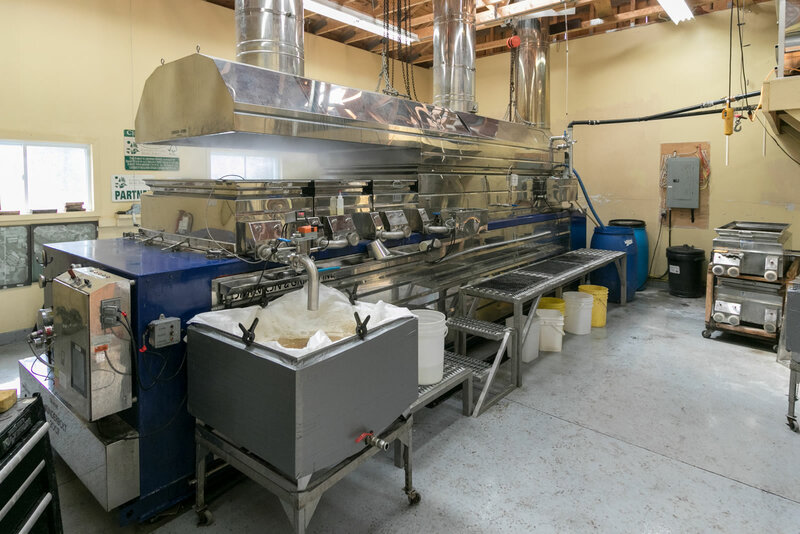 Nothing is added during the process to make maple syrup from sap. In addition to sugars, sucrose, glucose and fructose, it contains trace amounts of vitamins and minerals. The amount of fructose is less than 1% and much lower than in honey or corn syrup. It has as much calcium as milk. It takes about 40 litres of sap to make one litre of syrup. The colour of maple syrup varies from light to dark, which is determined by the composition of the sap. For example, more fructose will give a darker colour. Usually cool weather at the start of the season will result in light syrup. As the weather warms the syrup darkens and has a stronger flavour. The best way to determine which syrup is best for you is a taste test. All properly-made syrup is delicious. The trees are retapped each year with new tap holes. A 25 cm tree has one tap and larger trees have more taps, up to as many as five for a very large tree. The tap hole is about 5 cm deep in the white sap wood. Our sap is collected with a pipe line and tubing system running from each tree to a collecting tank. The lines are on a slope so the sap runs downhill. The lines are placed under vacuum, inducing a larger sap flow and also helping to pull the sap through the lines. 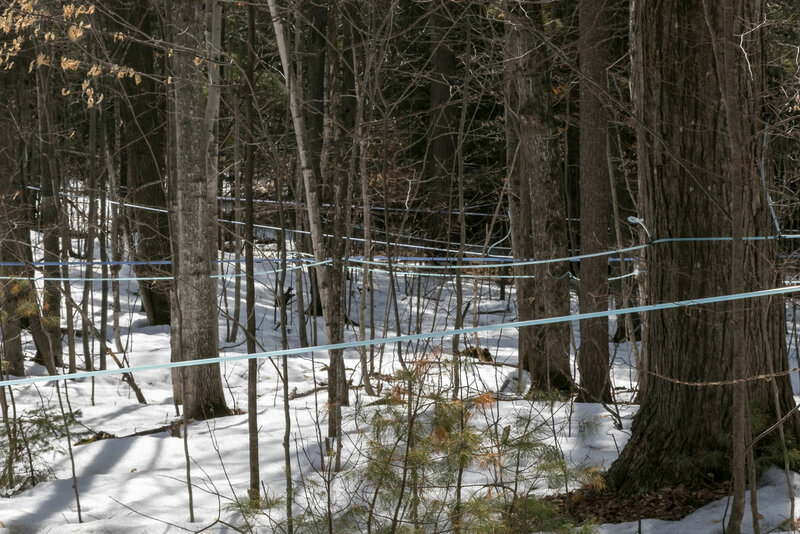 There are many kilometers of pipes and tubes in our sugar bush. Sap is concentrated to syrup by boiling away the water. Sap enters the evaporator at 2.5% sugar and finishes at 66.5% to 67% sugar. Syrup boils at a temperature of 4 degrees Celsius above the boiling point of water. The temperature of the boiling sap is constantly measured to determine when it can be drawn off as syrup. We use a refractometer to confirm the sugar content. All syrups, regardless of colour, have the same amount of sugar.